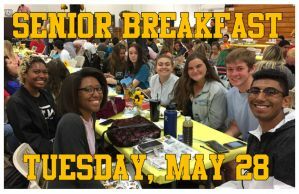 Senior Breakfast on MAY 28, 2019. We'll be enjoying an awesome breakfast, distributing yearbooks, having a few performances and speeches, and enjoying the company of our fellow Golden Bears. MUST PURCHASE TICKETS BEFORE THE EVENT. THERE WILL BE NO AT THE DOOR SALES.